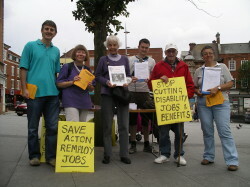 Trade unionists are stepping up their campaign against the closure of the Remploy factory. The site in Portal Way, North Acton, employs 36 people, 30 of whom have disabilities. The Remploy scheme has 54 factories across the UK and was originally set up in the 1940s to offer supported employment for disabled people but now the Government is considering plans to cut it's funding which would lead to all the factories closing. On Saturday, campaigners handed out leaflets in Acton’s Market Place, encouraging shoppers to sign a petition against the closure. Eve Turner, secretary for West London TUC said: “The risk is that these local workers will be thrown on to the scrap heap. It would be another blow to disabled people, whose benefits are being cut even if they are too ill to work. She also referred to a visit last year to the factory by Angie Bray, MP for Ealing Central and Acton. Ms Bray said: “I was certainly struck by the positive attitude I encountered when I visited the Remploy factory in Acton last year. “The most important thing for the future is ensuring that those disabled people who want to work are able to do so, and that they receive as much support from the Government to achieve this if they require it.